for Work purposes I need an indexed version of the Real Book 1 SIXTH EDITION. I'm happy to create the PDFB file, but what do I do with it once created? I have all the charts as one long pdf, but it's easy enough for me to split them into separate charts. How do I go about using the PDFB file, and what format do I save it in? Importing fakebooks via .pdfb scripts is a useful feature. 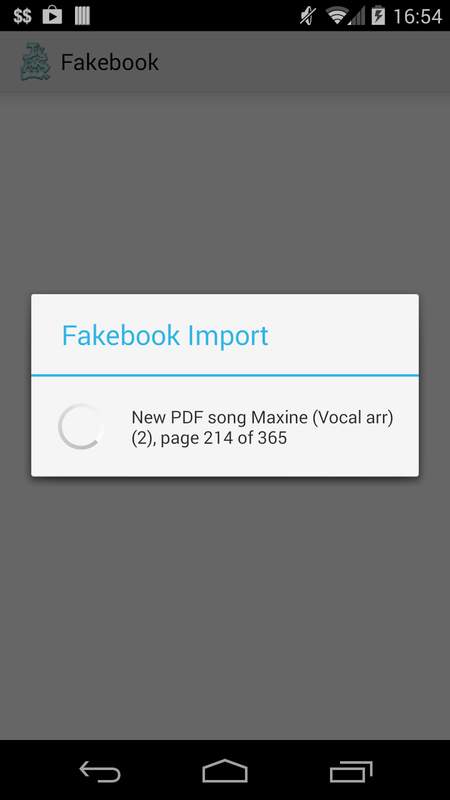 But I would prefer using it with local files: download both the somefakebook.pdfb and the somefakebook.pdf, save both in the same folder and start the import. How can I do that? With Import new songs -> File I can navigate to the .pdfb and run the import. But the import path in the .pdfb has to be a fully specified path like file:///sdcard/_SyncT/fakebook_django_2008.pdf. This is pretty inconvenient as every person to whom I pass my files has to edit the file and adapt the included path to his or her local situation. I tried file:///fakebook_django_2008.pdf, file:///./fakebook_django_2008.pdf, fakebook_django_2008.pdf (without file:///), none of them worked. 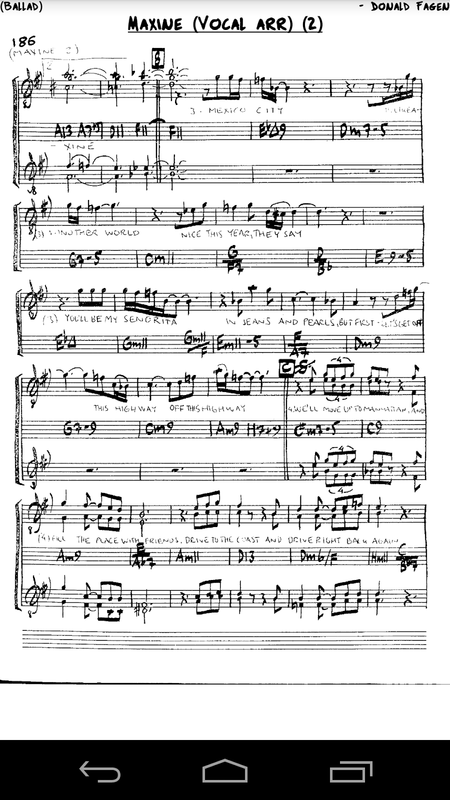 To my surprise performance is not an issue: Importing the 242 Songs in fakebook_django_2008.pdf took less than 5 minutes when I copied it to SD0 before and about 20% longer when I copied from a URL. Providing 'Composer first name' and 'Composer last name' doesn't make sense. How should that match with something like "V. Guerino & Jean Peyronnin 1928". So I put the complete 'Author' information into 'Composer last name' and misuse 'composer first name' for the key (which for sure would be worth an own dedicated database field). I tried 'Comment' first, but it didn't show up nowhere. The same happens with 'aka', 'tempo' and 'signature', they cannot be edited within Fakebook app and are displayed nowhere. 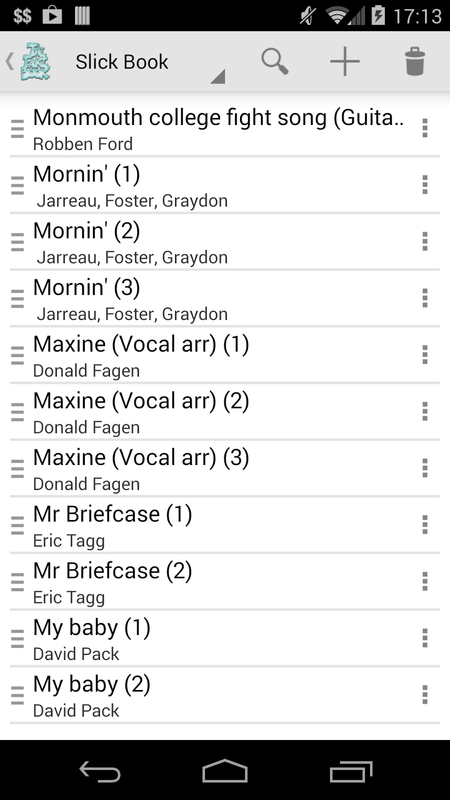 iGigBook is now available for Android, you have a lot of catching up to do! Yes I noticed that the app was published the other day. Great! I think we both benefit from the friendly competition. I need help please. I have been trying over and over again to import Real book 5, but it just won't work?? I tried Real Vocal book, and that worked fine, as did Slickbook. But Real book just will not download. Im using an Asus. Thank you! Jenny. No need to get back with more info, the problem shall be fixed (one of the download links were broken). Th scripts should all work now. Hi, is it possible to visualize 2 pages simultaneously? 1. How is page in PDF file specified - eg. if "Valse Hot" in Realbk1 is on page A13 - should I input A13 as page ? 2. Can I have one PDFB file with same playlist name but extracting from different several PDF files (which would mean multiple PDFB lines in the data file? 3. Where is the folder for Fakebook app and how can I clean up unwanted imports? OK so I did couple experiments. I looks like - regarding #1 - you need to input absolute page in the PDF file (counting cover as page 1). Regarding #2 - it might be a moot point since the app does "master index" on it's own so all you need is import each fake book as a separate playlist - using separate PDFB file. With master index PDF file for all fakebooks and with few lines of Perl I can not index all my PDF files - nice! My suggestion for immediate improvement would be to allow editing properties of the tune to include local MP3 file. Somehow I'm stuck in what feels like an endless loop importing the django book. The import would finish and i could see the music fine but switching applications and returning would cause the import to start sharing from the beginning. Running Android 4.4.4 on all hp tablet. I've hacked together a powershell script to do a little bit of the heavy lifting. it leverages the realindex file which I pulled the text out of. Maybe there's a better index online, but this gets the basics done. Write-Output "Done. Copy $pdfbFile and $bookname.pdf to $phoneLocation"
and here's the realindex.txt file I used.